When Facebook rolled out its new Timeline layout for branded Pages it created an opportunity to present a more exciting, expressive and personal experience to fans of your brand. 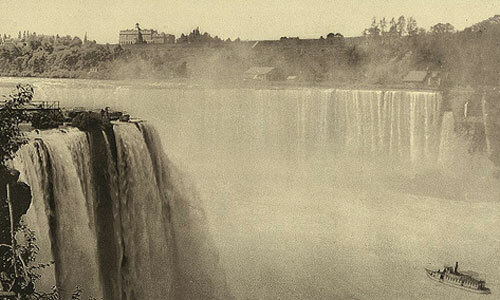 One of the most striking changes was the addition of a Cover image. The Cover image gives you an opportunity to add a touch of customization and closely align your Page with your company’s branding. When deciding what image to include for your company’s Cover there are many factors to consider. One factor that is frequently overlooked, and can get you into trouble, is legality. It’s important to make sure you have legal permission to use the image you choose. Here are some great resources you can use to find the right (and legal) image for your Page. 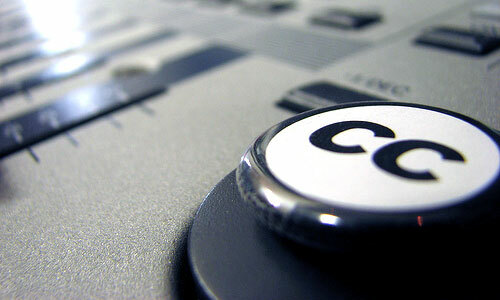 If you haven’t heard of Creative Commons you’re missing out. Whenever an individual creates something, be it written word, music, or images, it is automatically covered by copyright law. This means that if someone else wants to use or modify this work, he or she needs explicit approval from the original copyright holder. Creative Commons, however, is a system that allows creators who want their work to be shared and reused to grant permission without the need for direct contact with the publisher of the content. Some restrictions may still apply to the copyright, however, such as attribution. The popular photo-hosting site Flickr offers and maintains one of the largest Creative Commons databases in the world and can be a great place to find images. If you are unsure of usage rights for an image you can always message the responsible Flickr member and get his or her permission directly. While organizations like movie studios have worked hard to prevent it from happening, copyrights do eventually expire. Copyright expiration varies from country to country but once something is no longer protected by copyright, it falls into the public domain. This means that anyone is free to use the work, in any way he or she sees fit, without getting the permission of its owners or crediting its author. Copyright holders can also relinquish their rights. For example, most content created by the U.S. government is considered public domain. Flickr, again, offers a great resource to find public domain images in an area it calls “The Commons,” (unrelated to “Creative Commons”). While legally using other people’s work can be great, it may not fit your brand closely enough. 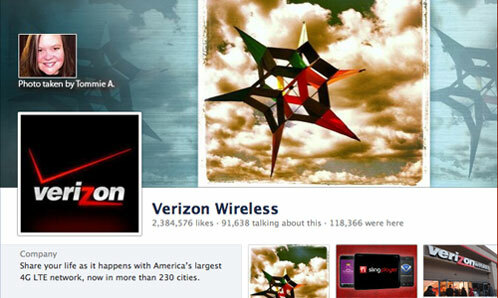 Another way to get creative with your Cover image is to open it up to your employees’ images. A great example is The Impossible Project. Impossible is a company that makes instant film for vintage Polaroid cameras. 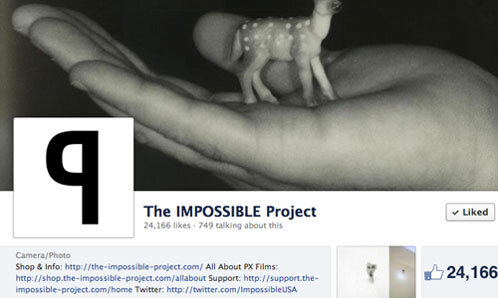 The team at Impossible uses its Facebook Cover photo to feature not only the company’s products but the work of its employees as well. This gives a fun, interesting, personal touch to its Page. The Cover image also gives you an instant impression of the people behind the Impossible Project and what the brand stands for. If your company has been around for some time, you likely have graphics from old products or advertising campaigns. These can make for fun conversation starters and celebrate your company’s rich history. 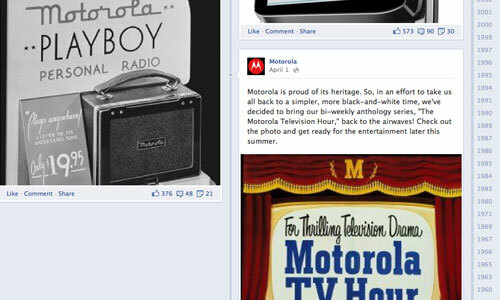 Mobile phone manufacturer Motorola has embraced a similar approach by using old graphics throughout its Timeline to celebrate important dates and product launches in the company’s history. Finally, another great resource might be your customers themselves. American wireless carrier Verizon took this route by offering its customers the option to submit photographs taken on their Verizon phones. 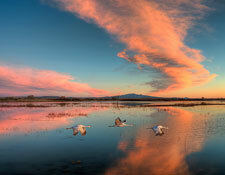 Participants could win prizes or have their best picture featured as Verizon’s Cover image. When it comes to choosing an image for your Facebook Timeline Cover, creative solutions can be fun for your customers and great for your brand. In each case, it’s advisable to consult with a copyright lawyer to make sure that you and the copyright holders of the images are appropriately protected.